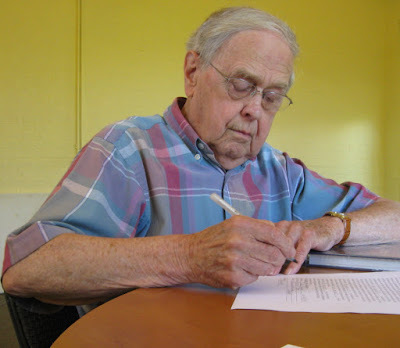 Wayne Denny sat comfortably at a round table in the old train depot in Berea, Kentucky. He was participating in a L and N oral history project. He can count five generations of family that have worked or are working for the railroad making him a credible story teller. 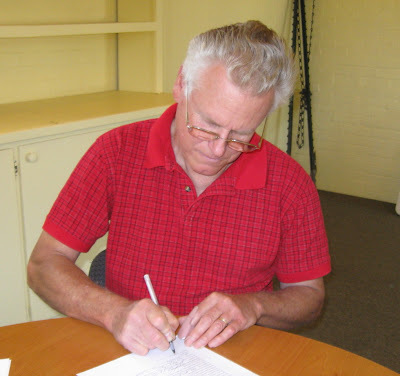 As he spoke, I recorded his words for the Old Town Berea Rail Depot's archives. His story begins with his family settling in Kentucky from Scotland and the British Isles in the 1700s. This generation of Denny's that arrived were stone masons and iron workers. By 1850 the Louisville and Nashville (L and N) Railroad Company was chartered and soon after in the latter part of the 1800s his great-grandfather, Levi Denny, was the first Denny generation to join with L and N. He was working for the railroad while he lived in Broadhead , Kentucky. Great-grandfather Denny and all the other employees at the time were paid in gold for their work. 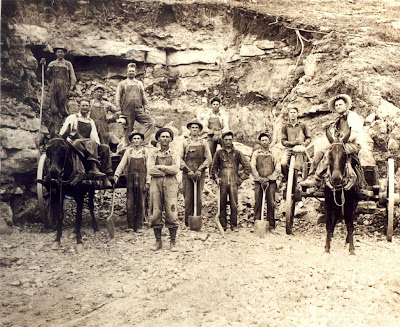 MULES, MEN, SHOVELS, WAGONS, AND BLASTING ROD -- KENTUCKY-- PROBABLY ROCKCASTLE COUNTY. Photo Courtesy of Maude Moore. The second generation to work for L and N was Roscoe Denny, born in 1904. He was Wayne Denny's grandfather who worked out of Cynthiana, Kentucky laying double tracking with horses and mules, also double tracked to Sinks, Kentucky. As well as working track installation he helped build RR bridges. The photo above displays the early working conditions during Roscoe's time with the RR. The photo above is a section crew other than the one Roscoe Denny worked with but taken during the period when he was doing the same type of work. L and N divided up the track line into sections. A section was about 55 to 60 miles or so long. Section crews were assigned sections to work and maintain. Roscoe Denny died of typhoid fever in 1927 at 23 years of age. He had worked for L and N for 4 years and had become a #1 bridge man when he died. The gold payroll was dismissed by the time Roscoe Denny began working for the RR and the currency payroll system was established for all future workers. L and N didn't sub-contract out their work. They were in charge of records, signals, bridges, tracks, engine manufacturing (except for the M1 engine), building depots, and all other concerns that meant running a successful rail line. They manufactured their steam engines in Louisville, Kentucky. ROSCOE DENNY JR. WITH A STEAM ENGINE AT THE BEREA, KENTUCKY DEPOT IN 1949. The third generation to work for L and N was Roscoe Denny Jr. He was Wayne's father. He worked on a section that included Berea, Kentucky.. He started with L and N in the bridge gang in 1944 and went to fire and steam engines in 1948. Eventually he became an assistant train master. Roscoe Jr. worked 42 years and 9 months for L and N.
Eventually, L and N became a top contender of rail transportation with Union Pacific and New York Central. Wayne related that when the family would be together that RR talk would be one of the main subjects. L AND N SECTION HOUSE. 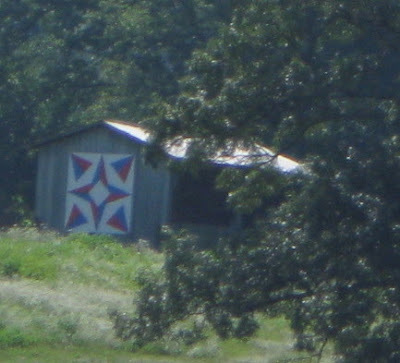 Photo from L and N section houses in Georgia. Wayne Denny, fourth generation, lived a good part of his younger life in Berea, Kentucky. 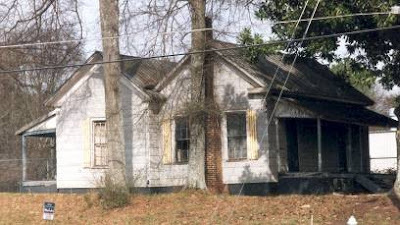 He lived with his grandmother and grandfather in a section house on W. Jefferson Street. He explained how L and N provided section housing for minimal rent to workers of each section. These were usually sets of smaller frame houses with one central large house. Wayne's grandparents lived in a large section house. He told me that all the section houses in Berea are no longer extant (existing). He remembers the section houses as painted a dark green with white trim-- these colors were used in all that Wayne was familiar with -- making it easy to identify houses in other sections. The homes all had large lots and his grandparents grew a large garden every year on theirs. He remembers walking to the Berea train depot to pay the minimal rent on his grandparents section house. Wayne Denny, born in 1933, has worked almost 42 years with the railroad. He began with L and N which was then bought out in the 70s and is now the CSX railroad. 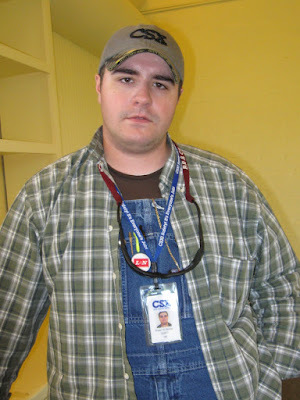 The fifth generation and the youngest family member to work for the now CSX railroad is Wayne's son Robert Denny. He speaks highly of the railroad. They sent him to school at Marshal University in Huntington, W. Virginia and then sent him to the Railroad Development Institution in Atlanta, Ga. He foresees a future of more lines being established in the U.S. The U.S. government is one of the largest users of the rail system. Presently he is an extra board conductor. An extra board conductor means, "on call"
Five generations of family members tells one that the railroading life was a good life. A LATE SUMMER BOUQUET FOR ALL MY GREAT BLOG VISITORS! 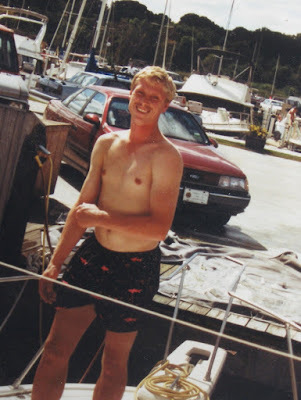 Erik greatly enjoyed the outdoors of Michigan especially the lakes and woods. He enjoyed playing organized hockey and softball which he played as a child on through adulthood. His favorite season was winter as he could sled with his dogs and daughter Cassie plus once in a while ski. 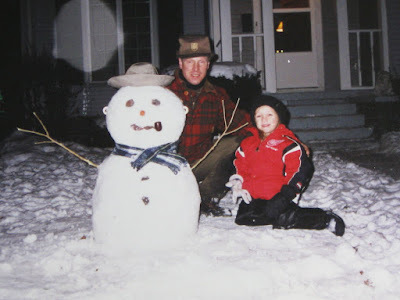 Every year it was traditional to build a snowman on the front lawn of his house with the love of his life -- his daughter Cassie. 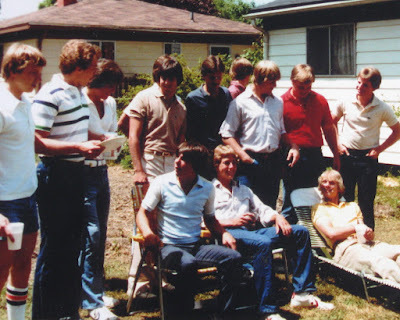 Quite the social person -- here he is with his longtime friends at graduation from Harry Hill High School. He is in the lounge chair. Erik with his siblings -- Kirk, Darcy, Erik, and twin sister Elizabeth. 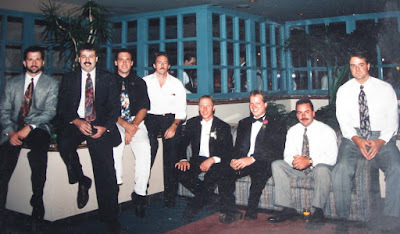 Erik at his wedding with old friends. He is fifth from the left. A driver for UPS for 21 years. 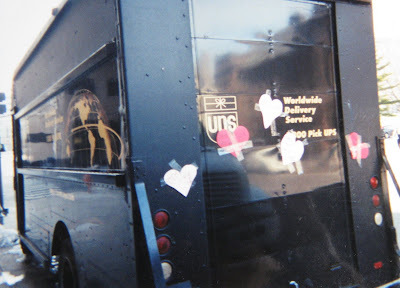 His truck decorated by a girlfriend while he was delivering a package on his route in downtown Lansing, Michigan. With loving memories -- your family and friends. My Irish blood rose a bit after I read a New York Times article that talked about the blight that is hitting the Northeastern part of country. It was slanted in such a way that the local home gardeners came out as the bad guys. He presented this, "bad guy" argument based on assumptions. In case you haven't heard there is a tomato blight that is hitting not only the Northeast but also my part of central Kentucky. It is the same type of fungus blight that hit Ireland in the mid-1800s which resulted in the potato famine that lasted for six years and caused untold deaths from starvation. Of course the Irish at that time were using mono-cropping methods for their potatoes. It was their main source of food and they ate it morning, noon, and night. This meant there were a lot of potatoes being grown. They grew these potatoes year after year with no diversity. The tomato being in the same family as the potato might be suffering from this same situation -- large scale mono-cropping by agri-business or also called corporate farming with no diversity. Being in the same family as the potato the tomato was being set up for the blight to hit. More about this later. First I want to tell you about my personal experience with the blight. I didn't know what it was at first. But I knew it was serious. I picked off all the green tomatoes and brought them in to ripen. At that point some of the green tomatoes had a few brown spots. I had hoped that I could still use them. But for some reason they turned red faster than usual compared to picking them green in late fall, The brown spots kept appearing with speed and then came the white fungus. 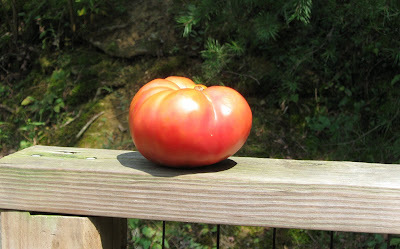 I finally found out that I had the Irish tomato blight from my mailman who is a wonderful local gardener. My blight hit fast and took down the tomato plants in about a week. At least that is what happened to mine and others that I know in Kentucky. 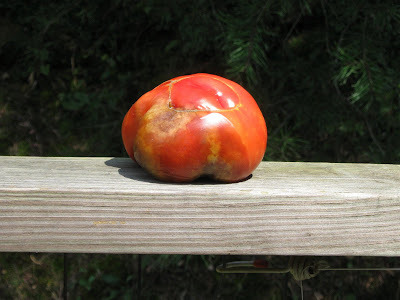 The end result is a sickly looking plant that had big and beautiful tomatoes before it began to die. It begins with soft brown spots around the tomato. At the same time as the brown spots are showing, the leaves begin to turn yellow then dark brown and whither on the vine. All new blooms fall off or I should say shrivel off. At that point your plant is a sure, "gonner." And it spreads to every tomato plant in your garden quickly. If you leave your tomatoes on the plant they also begin to get a white fungus growing out from the brown spots. I found out that composting the tomatoes will spread the disease. You need to put them in a plastic bag and dispose of them in your trash. Now not everyone has been hit by the blight in this area although many have. Above is a local tomato that I just bought this week at the Farmers market. 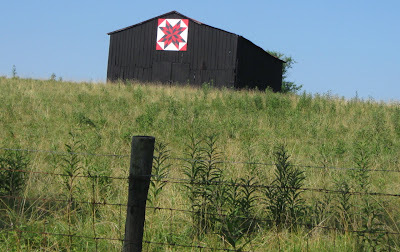 This farmer lives far out in the boonies -- don't know if that makes her untouchable or not. Getting back to the New York Times article. The author, Dan Barber, seemed to be trying to figure out what made the blight suddenly appear. He offered up several ideas. But the main one was that local home gardnerers bought their seelings from big box stores. The box stores had seedlings with blight and therefore the home gardeners were the transporters of the disease. He goes on to argue that big box stores buy from commercial nurseries that disperse the seedlings over many miles to the area stores. So, who is the transporters -- sounds like the commercial nurseries not the local gardeners. He doesn't give a thought to where the commercial mono-crop growers buy their seedlings! He doesn't mention that commercial growers do not have any diversity in growing their tomatoes -- just acres of the same thing -- tomatoes. The same goes for commercial nurseries -- they grow mono-seedlings without diversity. 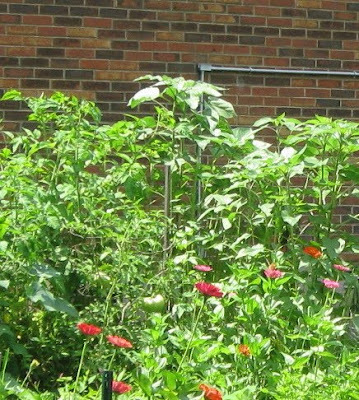 Local home gardens have diversity in their gardens unlike corporate farms. 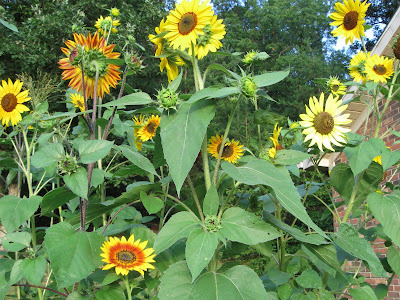 Many locals grow from seeds -- not always with seedlings from big box stores. Corporate growing with their hundreds of acres of one type of crop can set up major disease in a hurry if the conditions are right. 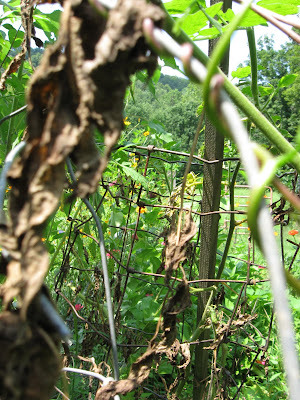 Or even corporate growing with contaminated (blight) seedlings can spread the disease. Deju vous from Ireland. One thing I did agree with in his article was that excessive rain and cool, humid weather could foster blight. But my feelings are you need a major outbreak of blight to unbalance nature. Like the Irish famine of mono-cropped potatoes we have too many mono-cropping corporate farms growing only tomatoes. Mr. Dan Barber of the New York Times, give us local gardnerers a break! Look in the corporate backyard not ours. A woman in a simple flowered house dress and a full cotton apron steps out her back door with a an oil- clothed lined bushel basket. The basket is heavy as it holds wet clothes. 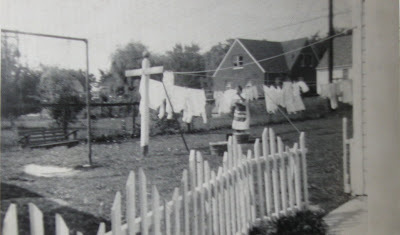 She walks cautiously from the back porch to the picket fence gate and follows the overhead rope line to a starting point where she will use her wooden clothes pins to hang her wash. It's all a ritual for her, one that she has done since she moved into her Michigan home in 1941. The T-shaped chunky clothes-posts that hold the lines were put in the ground by her husband. Painted white with green ball tops -- they are strong. In her basement sits the wringer-washing machine that she uses to do her wash. There is a rhythm to her washing; wash, wring, rinse again, wring again, rinse again, then wring again. Her wash-day is her ritual cycle. Climb up the basement stairs with the loaded basket, walk two steps down from the back porch to the picket fence, enter the picket gate, follow the line to where she wants to start hanging her clothes. Once or twice a week she follows this ritual. It is 1953 in the photo above. She has been performing this line drying ritual for twelve years while living in her same 1941 home. However, over the last few years, before this picture was taken, she began to lose her eyesight from glaucoma and had lost it completely by this 1953 photo. But she is strong, like her clothes line posts, and continues her same clothes-line ritual until her elder years. At the tenth annual L and N Railroad Day held at the historic Berea Railroad Station located in Berea, Kentucky on Broadway Street; I met and talked with some folks that were associated with the railroads of the past. Each had tales to tell about the world of "rails". This oral history project was part of L and N days. A one-day event that included working model trains, music, food and vendor booths selling railroad memorabilia. Oral histories can be done on any subject and are helpful to future historians that want original research material. I recorded five men and have given the tapes to the Berea Department of Tourism for their files at the Berea Railroad Station offices. These tapes will be available for listening. I spoke with four men: Harold Jordan, William Gregory, Orville Boes, and Wayne and Robert Denny. Previously, I wrote a post on the Denny family and their involvement with the railroads. 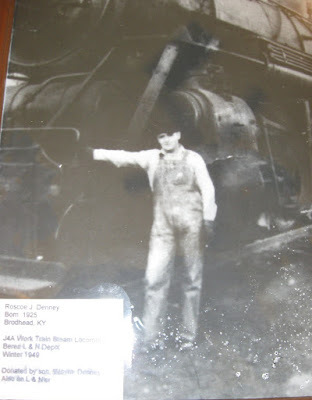 Click here to read, Kentucky Railroad Family, and view Mr Denny and his son Robert. Read about their fascinating family involvement with railroads through several generations. William Gregory's photo unfortunately, did not turn out so I am unable to post his picture. However his fascinating comments about his father are included here. Three generations of my family worked for L and N railroad. My grandfather on my mother's side, my father during WWll and myself in the summer while I was attending college. My father was a school teacher but worked for the L and N during the war years. His job was to guard one of the many train tunnels found in Rockcastle Countyin Kentucky. He would sit at one end and another employee would sit at the other end. They would sit there at night with a shotgun across their laps listening for any noise that might be a saboteur trying to blow up the tunnel. Trains were crucial to the war effort as they many times were loaded with troops and ammunitions. Every rail tunnel was protected in such a manner. The present Berea train station was doomed several years ago. It sat vacant and derelict, a true eye sore. And like so many buildings that reach this state of degradation it became a focus of possible demolition. A Miss Moore of Berea then led the fight to save the building and of course was successful as one can see today. Unfortunately many of the historic train stations have met their demise over time due to vacancy and abuse by vandals. My Uncle Butch worked for the L and N in Winchester, Kentucky for 42 years. Harold Jordan told how he would often visit his uncle at the Winchester station when he was young. At that time he was given the opportunity to help give messages to passing trains. 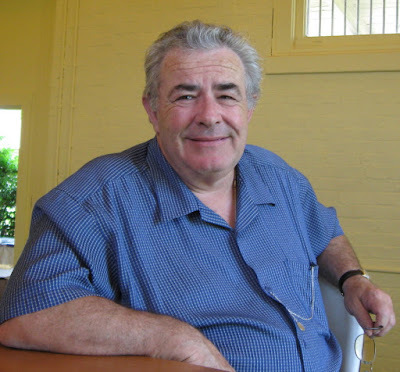 He wanted to work for the railroad when he got older however he ended up working in the automotive industry and also served time with the navy during the Vietnam war. To this day he still likes to ride trains and hear the whistle blow. The above comments are just introductions of the interviews they were given that day. If you are a railroad buff or a historian or are simply interested in what else was said that day about the railroads -- contact the Berea Tourism Council at (800) 598-5263. Jesse Splawn at 77 was still going strong as a gardener when I met him in 1989. 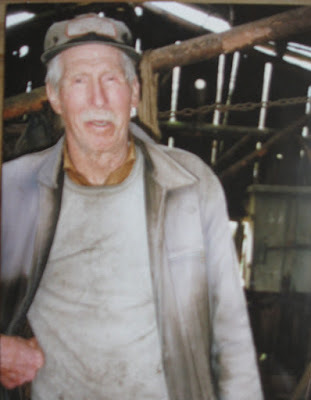 He had lived his entire life since he was three on a hundred-acre family farm outside of Brownsville, Oregon located in the beautiful lush Willamette Valley. His roots were deep in the area. By definition, historically, a front-dooryard garden is one that is within the usually enclosed front yard of a home. The Splawn front-dooryard garden began in 1915 when Jesse was three. His mother planted and maintained the garden and her children helped with the weeding. 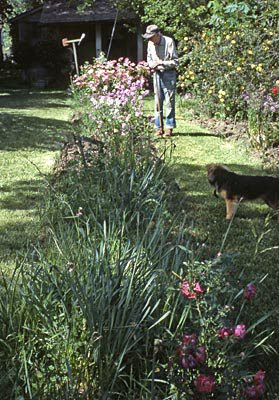 Jesse assumed the care of the garden after his mother died in the mid-1950s. He assured me that it was still of the same basic arrangement that his Missouri-born mother first planted in the early 1900s. Jesse's mother lived her early life in Missouri and moved to Oregon shortly after she married Jesse's Oregon born father. His mother's garden pattern was reflective, perhaps, of Missouri gardens. 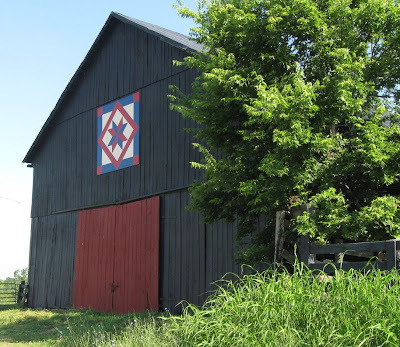 She moved to Oregon as a young adult so she had time to fill her mind with Missouri patterns. Jesse, claimed her garden was plotted out according to,”what she knew in her head." and not by the,”garden pattern books" that were available at that time. The layout of the garden was of two (2) approximately 30-foot long beds separated surrounded by weedy-mown pathways. The two beds were rectangular, one being approximately four feet wide and the second ten feet wide and were positioned perpendicular to the front porch. The ten foot wide bed lined up against a fence line and contained large shrubs as well as perennials and rose bushes. The four foot wide bed contained the same as the ten foot minus the shrubs. The front porch overlooked the garden and was a small open one with a waist-high railing along its front. The garden and the porch were south facing. Both garden and porch were integral parts of the front-dooryard garden complex. 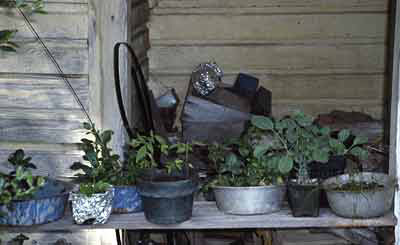 On the front porch were very old pots and pans that were damaged but provided excellent containers for growing plants. Jesse got the plants for the old pots at the nearby cemetery. He explained that there was a place where the plants were dumped and he would pick out a few for nurturing. His front porch garden had a quaint look although that was not the intent. His nurturing was practical and being quaint was not a part of his thinking. 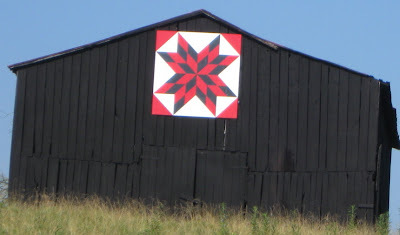 At the end of the four foot wide bed, near the front porch, was a wooden unpainted whirly-gig that was of the same design as the original one that was built for his mother's first plantings. The whirly-gig was a simple, unpainted design, the top piece turning with the direction of the wind. About four feet high it was made of four pieces - the pole, head, body, and the propeller that turned with the wind. Over the years the whirly-gig had to have various parts replaced as the damp Oregon winters eventually rotted the wood. The whirly-gig remained the same design through all the repairs. Jesse maintained the bed by shallow digging with a shovel -- no mulch -- just soil exposed around the plants. He did not use any chemicals or even organic fertilizer or compost. He just let Mother Nature take care of the health of the plants as he felt that she did a good job. Even with Oregon's dry summers he did not use any watering system to supplement the droughty weather. The garden evolved apparently from knowledge of tough plants that could survive this type of care. Roses were the predominant plants in both beds. In the wide bed a Harrison rose bush grew. Jesse said it had its origins from the early days when his father's ancestors traveled with the root stock along the Oregon Trail.. Occasionally, a small snake slithered in and out of the grass as one walked around the garden -- it was rich with wild critters. Birds sang woven complexities of various sounds. One of the old hardwood trees near the garden had an old blooming rose that climbed twenty-plus feet up the trunk and into the lower branches. Overall it was a chorus of nature's spontaneity. Jesse died about ten years ago. He was the last caretaker. The garden no longer exists. 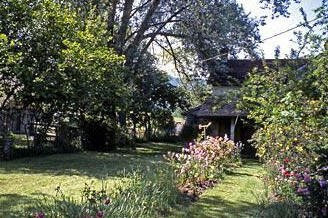 It was an example of a distinctive folk vernacular garden. It contained artistic embellishment, social history, and individual predilections. 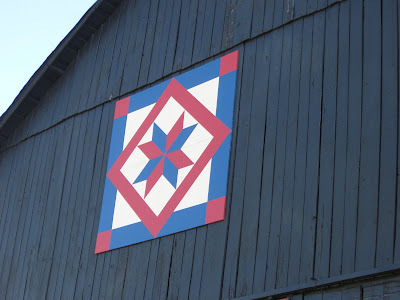 It had garden patterns that were woven into the social fabric of early settlement in Oregon. It was a naturalistic form of expression conveying the emotional roots of the Splawn family. My jaw dropped as I went to my small garden patch garden to gather some cucumbers, basil and tomatoes. I knew that there had been a horrific downpour of rain the night before but--- but -- not this bad that it would do such destruction! I cannot even bear to take a photo of it now! Is all I can say is that it is 50 percent obliterated. Cucumbers -- smashed to the ground, dill gone, tomato cages tilted or completely pushed down to the ground, flowers stampeded looking forlorn on the ground. Did a deer get into this fenced in little garden? Something looked suspicious -- the small homemade gate I had made was pushed to the ground. I don't think a deer would bother to push down the gate when it could easily jump the fence. Hmmm. Now along comes Mr Inocent to give a look at this destruction with me. Hmmm I thought could this be the work of Sallie Tomato -- the dog I got 11 months ago. 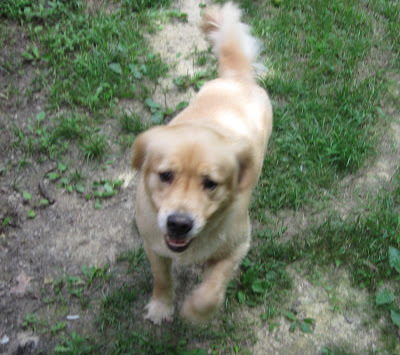 Mr. 100 pound golden retriever that is a frisky five year old.? No, it couldn't be, could it? I watched Sallie Tomato rather closely the rest of the day. Then when he thought I wasn't looking he went straight for the garden and pushed through the chicken wire fence like it was feathers. 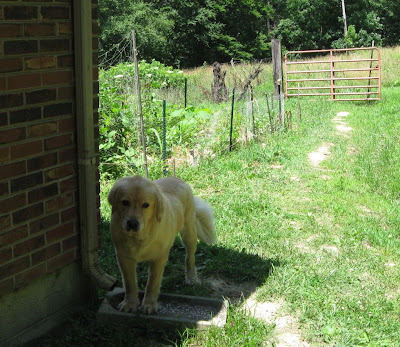 He had a smile on his face as he lurched toward the tomato cages that were still standing. Caught you, I yelled. He looked at me as if to say, "who me?" "Why do you think they call me Sallie Tomato." "I do have a reputation to live up to you know." I chased him out of the garden yelling, "you better run you big trouble maker!" For an hour I stewed and couldn't even look at him as he brought different toys to me, I think now this was his peaceful way of saying, "I didn't know I wasn't supposed to eat the tomatoes." Sallie and I need to have a "beer summit" to talk over this atrocity. 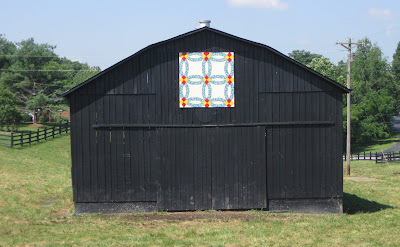 Labels: BARNS, FOLK ART, VERNACULAR ARCHITECTURE.